This book takes a generational look at the fast-changing world of the woodcarvers of Oaxaca, Mexico. These artisans became famous in the 1980s for their colourful novelty figures, a contemporary folk art that Shepard Barbash and Vicki Ragan documented in the book "Oaxacan Woodcarvers". Fourteen years later, beginning in 2004, Barbash and Ragan returned to Oaxaca and discovered many changes in the lives of the woodcarvers they had known. Barbash effectively presents their personal stories in narratives drawn from interviews accompanied by Ragan's arresting black-and-white photographs of the carvers and their lives today. A series of diptychs of the same people taken in 1989-90 and again fifteen years later are accompanied by extended essay-captions on the changing circumstances shaping their lives.Faced with a glut of carvings on the market, declining sales abroad, and an unsteady supply of tourists at home, a number of Oaxacan artisans put aside their craft to become mojados, or foreign workers, drawn by the economic opportunities north of the border. With eloquence and insight, the book puts a human face on bilateralism, a fancy term to denote divided souls. From the dusty villages of Oaxaca to the orchards of Oregon and the kitchens of Chicago, the carvers have joined millions of Mexicans who, unable to find good work or sustain their recent prosperity in their own country, have fled across the border: artisans and aliens. 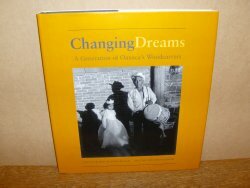 "Changing Dreams" is a moving story of change and survival, conveying the growing aspirations and changing dreams of a people struggling to catch up without leaving too much behind, whose creations we enjoy but whose lives we barely understand.155pp.